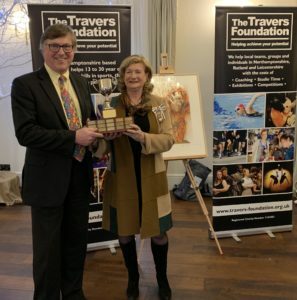 The Travers Foundation was founded in 2012 by Terry Forsey and is a 100% volunteer run charity that helps local talented young people to achieve outstanding results in sports, performing arts and creative arts. Our aim is to enable their success, so they may forge their careers in their chosen discipline. Based in Gretton, the charity supports young people in Northamptonshire, Rutland and Leicestershire. Young people seeking traditional business careers have many choices to develop their skills and experience. This includes University education, in job training and a range of apprenticeships. For each of these alternatives, suitable funding options exist. Unfortunately, if a young person seeks a career in sport or the arts there are no alternatives, with the exception of the “bank of Mum and Dad”, until you reach elite performance. Thier support helps to build confidence and resilience in young people, enabling them to aspire to a professional standard in their career and to look beyond their current circumstances. Young people start to believe in themselves and their abilities, excel in their chosen discipline and start to create their own careerSupport from The Travers Foundation reflects positively in communities creating positive role models for their peers to follow. The charity has grown and in 2017 over 20 volunteers helped 151 young people achieve their potential winning 139 awards and medals nationally and internationally. 2018 remains as busy with 25 current funding contracts in place for individuals and groups, adding Cycling, Opera Baritone and Dog Agility to our varied roster. The Travers Foundation receives local media coverage in press, radio and TV. This achieves two purposes recognition to help fundraising and the attraction of new applicants for support.